Stephan is the master of the pit and will be doing his magic along with the other fixin’s. Great food, wine, and music in a country setting will set the mood. Come join us and relax under the oaks! 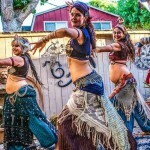 An evening of summer enchantment, with belly dancing inspired by the nomadic tribes of the desert. Graze on Middle Eastern delicacies, enjoy sensuous wines, and have your fortune told by Madam Serena, all woven together by our riveting raconteur. Come enjoy a magical evening at the Bedford Courtyard where you will feel carpets really do fly! 5:30 to 8:00 pm. $20.00 per person. Wine Club members $15.00. Please call 805-344-2107 or email for reservations. You are currently browsing the Bedford Winery blog archives for June, 2014.